vpSim is an easy-to-use, virtual patient authoring system designed by the team at The Laboratory for Educational Technology. Virtual patients (VPs) are computer-based simulations of medical cases for education and assessment. The Lab recognized barriers to development of VPs including high cost, complex authoring software and difficulty creating and visualizing complex branched decision paths. vpSim was developed to provide an authoring environment for medical educators that required minimal training and stimulated creative case writing. vpSim uses a Flash-based drag-and-drop visual interface for case design by representing screens and decisions with a map of nodes and branches. 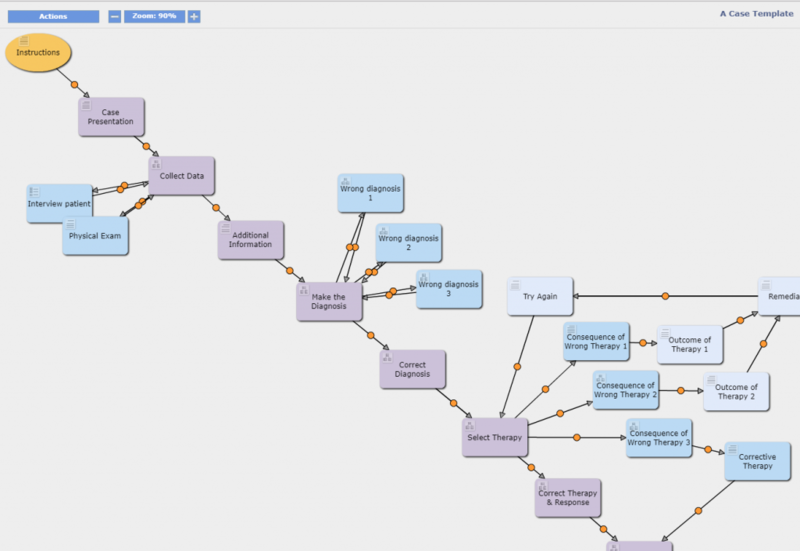 Patient data is added to each node using simple web forms that approximate the resulting on-screen appearance of the case. Features, based on user feedback, include multimedia support and counters to track score, money, and time. In 2017, vpSim was moved to a more robust, secure and modern server environment on Amazon Web Services (AWS). It was also updated with a responsive design to make it mobile friendly and provide a clean, modern user interface for students.